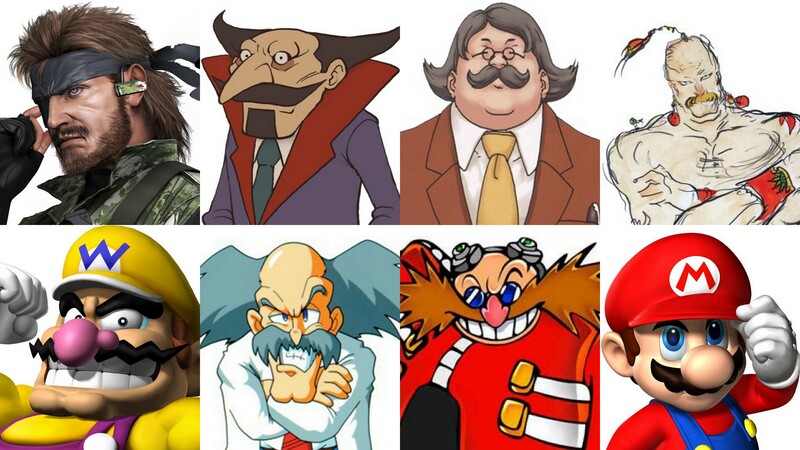 Clockwise, beginning at the top right: Yang (Final Fantasy), Mario (Super Mario Bros.), Dr. Eggman (Sonic the Hedgehog), Dr. Wily (Mega Man), Wario (Super Mario Bros.), Naked Snake (Metal Gear Solid), Don Paolo (Professor Layton) and Marvin Grossberg (Ace Attorney). This is a collection of magnificent video game mustaches: a stache stash, if you will. Which is best? My money is on Mario’s mustache. It lacks the extravagant flair and staggering size of the competition, yet it boasts an understated charm. This post was originally published on May 8, 2013. TMTF shall return with new content on April 20, 2015! This entry was posted in Geeky Wednesdays and tagged Ace Attorney, Final Fantasy, Metal Gear Solid, Nintendo, Professor Layton, Super Mario Bros. by Adam Stück. Bookmark the permalink.